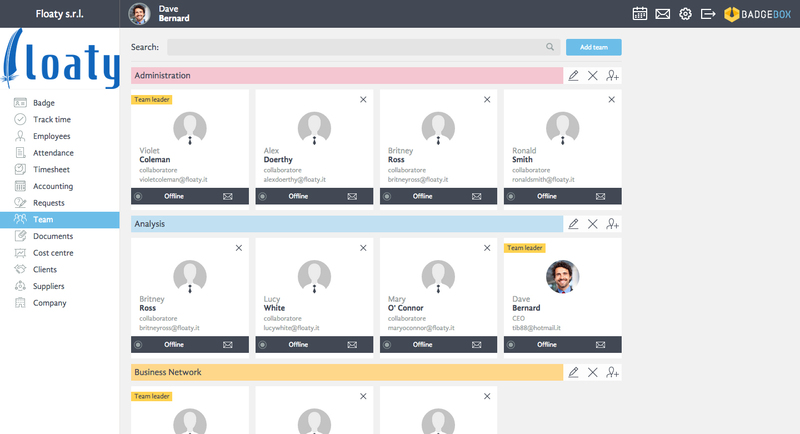 One of BadgeBox’s functionalities is the possibility to create teams and organize communication, data and task sharing between team members. In order to create a new team it is necessary to go to the section “Team” and press the button “Add team”. After filling all required details, such as name, team leader, detail and color, a team will be created. Once it is created, it is possible to add other members, edit information or delete it. Another function that facilitates the process is synchronization with a task . This means that once you assign a specific task to a certain user, he/ she will be automatically added to the team. Team leader is a person that can be entrusted with tasks such as timesheet, request or expense approval. In order to entrust a specific user with this responsabilities, the administrator has to go to the section "Company" and define areas request, timesheet and expense. All other BadgeBox functions are connected with this area, therefore, it is possible to create a group of To-do and share it will all members, communicate with them by posting on their walls, share documents or create an event and call other members for a meeting. In order to find out more about these functions, please visit our other help tutorial sections.